Judging a book turned into a game by its cover. Blowfish Studios and Level 77 are no slouches when it comes to releasing games on the Switch. Their game releases are varied and entertaining and have become one of the more pronounced game developers during the climb to over 1000 games on the Nintendo Switch. Storm Boy is an interesting game which is more of an interactive storybook of sorts. The book it is based on, written by Colin Thiele, tells the story of Storm Boy and his rescued pelican. The game is broken up into four primary chapters each telling a section of the story. You start off first on the island in Southern Australia where you move left…and sometimes right but mostly left. Along your path, you will see story sentences in the sky or ground that tell you the story of Storm Boy, his pelican, a rescue mission and a few other odds and ends. The game itself doesn’t take long to complete, and in some ways, I find it slightly difficult to call Storm Boy a game. The story only last 20 or so minutes and plays out more like an interactive storybook. You’ll walk along the beach, guide a bird through the sky, feed some baby pelicans, and play fetch with your pelican friend, Mr. Percival. Each chapter is mostly just walking and revealing the stories narrative beats, which you have to read. There aren’t any voice-over options. While you walk the stories words are triggered at certain points along the coastline. This means if you move at all outside of the story box, the words disappear. So there’s a lot of stopping and starting to walk, and sometimes backtracking ever so slightly if you missed a block of text. Aside from the walking moments, you have those aforementioned interactive areas. These sections of the game seem to be meant to break up the sheer monotony of walking, but the interactive moments themselves don’t have goals or high scores. They are just areas of the game that you can move around in, press an interact button, or mash a button to do a task over and over again. One event, where Storm Boy rides down the sandy hill on a piece of cardboard has no end in sight. It’s like the largest hill ever. There are bushes there, but they don’t impede your progress. Each interactive area has a quick back button for when you get bored…which is about 20-30 seconds into the activity. The game has some nice soothing music to it that fits well within the story and location of the tale. There’s nothing really catchy and since you probably won’t be going back to the game not much to say about it either. Game audio consists of some bird squawks and minimal voice acting. Mostly just some grunts and one-off lines that accompany the ‘cut-scenes’ where the game screen goes into a letterbox mode and tries to be more cinematic. I will say that Storm Boy does have a great art direction that feels a little like Old Man’s Journey, which is also available on the Switch. The art style is very reminiscent of some colorful children’s books. There is one interactive area where you get to swim in the ocean. The seafloor is rendered nicely and is one of the more memorable areas of the game. Storm Boy is $5.99 in the NA eShop, which isn’t a lot, but there are probably more things you could spend your money on in the eShop or your local sandwich shop. It’s difficult for me to recommend a game like this that is a one-off purchase that you likely will not go back to or remember much of after you’ve completed the game. 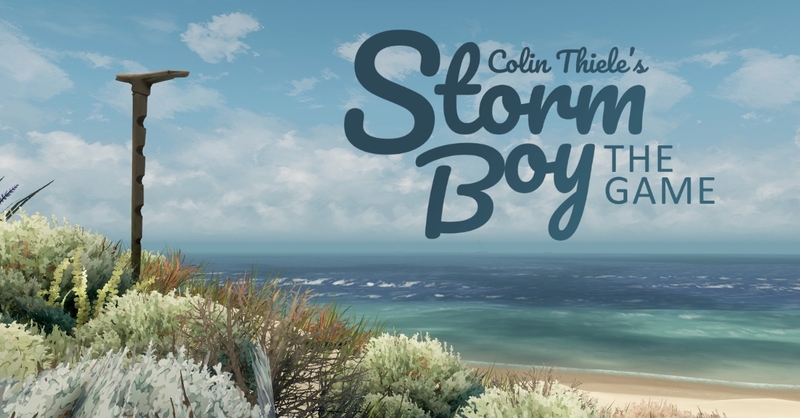 Storm Boy’s only redeemable qualities is that it’s a good story with a good art style, but at the end of the day, it is a mediocre game.